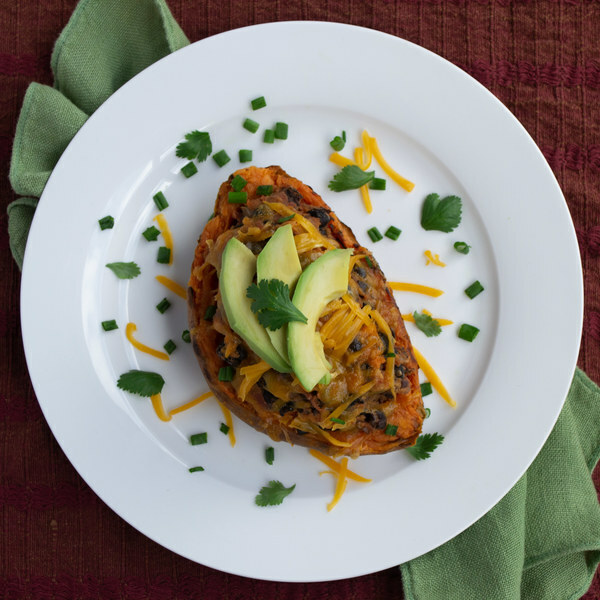 ← Stuffed Mexican Sweet Potatoes. Preheat oven to 450°F and place the rack in the center position. Cut sweet potato in half lengthwise. Rub the inside and outside of the potato with oil and season with salt. Place cut side down on a baking sheet pan and pierce skin all over with a fork. Bake for 25 minutes until sweet potatoes are fork tender. Meanwhile, preheat a medium saucepan over medium heat. When heated, add butter to the pan. Peel and small dice the onion. Peel and mince or press the garlic. Add to onions and garlic to the pan; cook, stirring frequently, until translucent, about 5 minutes. Drain and rinse beans in a colander. Add to pan with the onion and garlic. Drain diced tomatoes using the colander and discard juice. Add tomatoes to pan. Season the bean mixture with chili powder, cumin, salt, and cayenne pepper. Stir until fragrant, 15 to 30 seconds. Turn heat up to medium-high and cook, stirring occasionally, until the beans are warmed through and tender, 5 minutes. Mash some of the beans with a potato masher. Remove the sweet potatoes from the oven when fork-tender. Let cool for 5 minutes. Scrape out the flesh of the sweet potatoes, leaving the skins intact and a thin layer of potato inside, set skins aside. Add the sweet potato flesh to a bowl with the bean mixture, stir to combine. Halve and pit the avocado; slice avocado crosswise while still in the skin and scoop out with a spoon. Shave the cilantro leaves off the stems; discard the stems and mince the leaves. Trim and discard root ends of green onions, and chop. To serve, return the bean mixture to the sweet potato skins. Top with cheese, avocado, cilantro and green onion. Squeeze lime over top. Enjoy!